In its Networks Services Centre in Finglas, Gas Networks Ireland has achieved a pioneering sustainable building, whose cutting edge features include passive stack ventilation, an ingenious radiant slab heating and cooling system, and a flexible and intuitive building management strategy. The Networks Services Centre has won several awards, earlier this year adding international architecture magazine Architectural Review’s prestigious Work Award to not one but two RIAI awards, a Green Award and a Concrete Society Award, and is a fine example of the fact that a building can be highly-functional and infused with sustainable innovation without having to compromise on aesthetics. Located on a triangular site no more than 100 metres from the rumbling of the M50, the Gas Networks Ireland Networks Services Centre is a 5,200 sqm two-storey block with five courtyards, screened by an outer skin of perforated aluminium, and topped by a green roof, vent shaft and renewables tower. The centre acts as an admin, parts storage and training hub for Gas Networks Ireland, with over 240 staff members spread across its two floors. The vision for the Networks Services Centre came about in 2008 when Gas Networks Ireland – then called Bord Gáis Networks, prior to the privatisation of Bord Gáis Energy – was undergoing a significant transformation, and the decision was made to amalgamate four of its key operations buildings in Dublin into one location. Sustainability was a key part of the brief from the onset, and one of the main focuses was achieving an Excellent rating in BREEAM, the BRE’s sustainability rating system for non-residential buildings. Due to this focus, the centre became one of the first office buildings on a brownfield site in Ireland to pursue sustainability in a radical way. The building’s design was chosen via a design competition, which was won by Denis Byrne Architects. While most of the shortlisted designs proposed two separate buildings, with administration divided from ancillary services, Denis Byrne Architects’ competition entry put all of the services together into one building. Denis Byrne, owner of Denis Byrne Architects, explains: “We liked the idea of a single building in order to express a democratic organisation, one where white and blue collar workers are under the one roof and share the same facilities.” As well as that, one building would mean a reduced surface area in comparison to two or more separate buildings, and would therefore be easier to insulate and achieve high energy efficiency. The key focus of the design was developing open-plan workspaces, and three-quarters of the two floors are open plan. “We wanted to create an open, permeable and informal workspace, interspersed with gardens, that would promote an inter-departmental, collaborative and humane working environment,” says Byrne. A strong environmental strategy was an integral part of the design and structure of the building from the very start. The building’s super-insulated envelope has a U-value of 0.15 and consists of a Stanta wall system with mineral fibre insulation wrapped in a Sto external insulation system – all sitting behind a second rainscreen of anodised aluminium panels. The centre also achieved an airtightness level of 1.81m3/m2/hr at 50 Pascals. Artificial lighting can be a significant proportion of a building’s energy use, and maximising the use of natural daylight was one of the main drivers of the design. The largely open plan of the building is punctuated with five courtyards that allow for high levels of natural daylight in the building, which reduces the need for artificial lighting. All of the building’s lighting fixtures are controlled by light detectors and dimmers, further pushing down the lighting costs. The building has an ingenious heating and cooling strategy, which makes use of the thermal mass of the concrete slabs that form the building’s ceilings to heat or cool the building as needed. Cormac O’Loughlin, Gas Networks Ireland’s highly-experienced regional facilities manager, explains: “We have 27 geothermal bore holes going down 100-150 metres. During the winter months, we take in water from them at 13-15C and we put that through our ground source heat pump which heats the water up to 35C. The water then gets pumped through the pipes set into the concrete ceilings.” During summer, the Dynaciat ground source heat pump is switched off, and the chilled water from the bore holes is brought straight up into the building and pumped into the ceiling slabs. However, the heating and cooling system is not as straight-forward as it initially sounds. Each floor has ten heating zones, and the building’s Trend 360 building management system allows the temperature to be adjusted in each zone. Each zone is also controlled by a thermostat; if the thermostat hits a set maximum or minimum temperature, it closes or opens the valve to let water in or out of the ceiling slab, as needed. What is also interesting is that, unlike many typical office buildings of its size, the Networks Services Centre is ventilated naturally, using a stack effect. The air is passively sucked out through a large chimney in the centre of the building’s tower, using the stack effect and wind pressure, passing through a Trane AHU CCEB DG air-handling unit with a heat recovery coil, which transfers the heat to the fresh air being brought in from outside. The air flow velocity in the extract chimney is limited to 0.5-1 m/s to limit the pressure drop. The building’s renewables tower houses a 100 sqm installation of photovoltaic panels, which largely power the ground source heat pumps. Nine banks of Carey SKY 12 CPC 5 evacuated heat tube solar thermal panels, along with Remeha gas condensing boilers, provide hot water for the building’s wash basins and showers. Such a complicated brief, with its key focus on energy efficiency, sustainability and achieving a high BREEAM standard would not be easily executed, so it’s perhaps no coincidence that the contractor chosen for the job was none other than Walls Construction, the company that constructed Simmonscourt and Minerva House in the RDS, the first development in Ireland to achieve the BREEAM Excellent rating. The contracting firm was meticulous in maintaining the paperwork surrounding the build. However, problems arose due to subcontractors not realising that their products should be BREEAM certified. Lloyd describes how, on a few occasions, they had to contact the BREEAM governing body regarding alternative products that didn’t have ratings on their system, and had to submit all of the product’s documentation, in order to receive approval that the product fulfils BREEAM criteria. The result of the careful consideration of sustainability and energy efficiency at design stage, and the attention to detail exhibited at construction stage, is a building that is not only beautiful and functional but also highly sustainable. As Gas Networks Ireland regional facilities manager O’Loughlin, in primary energy terms reveals, the building consumed under 55 kWh/m2/yr worth of natural gas and 313 kWh/ m2/yr worth of electricity in 2015. While the electricity use figures in particular might sound high compared to the figures readers may be familiar with for dwellings – for instance an A3 BER requires a primary energy total of less than 75 kWh/m2/yr – it’s important to view these figures in context. For starters, the building is constantly in use – it’s occupied 24/7 due to its national distribution gas control role for Ireland and emergency response role for Dublin and surrounding counties. Then there’s the fact that the building includes data centres, which tend to chew up electricity, bringing a significant primary energy penalty. 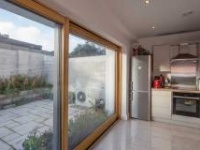 Although the fabric standards are in and around passive house levels in certain regards – the opaque element U-values range from 0.15 to 0.16 including allowances for thermal bridging – the glazed elements are some way short of the sub 1.0 U-values typical of passive houses, while still being far ahead of Ireland’s non-residential building regulations. And while the passive stack ventilation system includes a passive heat recovery component, the efficiency rates are some 20 to 30% short of the sorts of levels achieved by MVHR systems typical of passive houses. These factors combined may not be an issue in offices only occupied during the day, but must surely result in more of an energy penalty for buildings in use at night too. Remarkably for a building with several sustainability awards under its belt and a BREEAM Excellent rating, its recently published BER came out at a B3, with a score of 353.78 kWh/m2/yr along with an energy performance coefficient of 0.86 and a carbon performance coefficient of 0.94 – meaning the building is supposedly only 14% more energy efficient and 6% less polluting than it would have been if built to the substandard Part L requirements for non-residential buildings. At first glance the accuracy of this rating would appear to be borne out by the fact that the measured energy use for the building is within 13 kWh/m2/yr of the level calculated in the BER. But on deeper analysis, such a notion is shown to be nonsense. As BER assessor John McCarthy of McC McCarthy Engineering explains, the BER relied in many cases on punitive default data in the absence of certified performance data for components as per SEAI’s requirements. 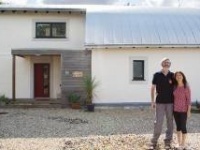 Readers may recall a similar phenomenon occurring when BER assessor Gavin Ó Sé put Ireland’s first certified passive house, passive pioneer Tomás O’Leary’s 350 sqm house, through the software used for dwellings, Deap. The initial result came out at a C1 rating, again in large part due to punitive default values in the absence of paperwork that met SEAI’s requirements. According to O’Leary, this house has cost circa €250 per annum for heating and hot water since the family of five moved in over a decade ago. 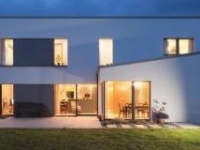 Yet the closest example in SEAI’s A Guide to Building Energy Rating for Homeowners – a C1 rated 300 sqm house – has an estimated combined heating and hot water bill of €3300. If this example seems unfair, it makes an important point: the assumptions contained in a given BER may bear little resemblance to reality, especially where default information has been used. By way of illustration, SEAI has confirmed to Passive House Plus that the primary energy factor for electricity in SBEM, the calculation tool used to generate BERs for non-residential buildings, is currently 2.7 – a figure that’s approximately ten years out of date. SEAI updates the factor with each new version of Deap, and the current factor is 2.19 – meaning that a building that only uses electrical energy would see its BER improve by 19%. Similarly, BERs don’t count so-called unregulated energy use – the energy required to run equipment, PCs etc. And in a building like this, unregulated energy use contributes a substantial amount of the total – approximately 45% of the electrical load, based on Gas Networks Ireland’s energy monitoring data, meaning the 313 kWh/m2/yr primary energy figure drops to circa 173 kWh/m2/yr, or 228 kWh/m2/yr including gas use too. But the process of preparing this article has provided the opportunity to reappraise the building’s BER. Although the level of technical information that Passive House Plus demands of the buildings featured in these pages can be onerous, it does result in useful data emerging. 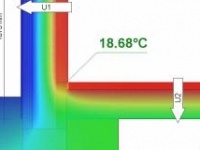 In the absence of available date for the BER, John McCarthy relied on default data for all U-values, heat pump efficiency, airtightness, thermal bridging, solar transmittance factors from glazing, and air leakage rates from ductwork for ventilation and cooling systems. Although it’s not clear that all of the data Passive House Plus gathered would have the necessary paperwork for SEAI to permit its use, we asked McCarthy to re-run the calcs based on adding in some of the missing data – U-values, airtightness test result and heat pump efficiency. The BER shot up from a B3 to a B1, and a score of 236.6 kWh/m2/yr. When the primary energy factor for electricity was updated too, it reduced the total to circa 192 kWh/m2/yr and an A3 rating. What’s more the EPC fell to 0.47 – coming in 53% lower than Part L requires. The original specification was to provide energy savings of at least 40% relative to a typical low-energy office. The performance of the Networks Services Centre is, in fact, exceeding its design requirements. In terms of overall energy use, the centre currently consumes 45% less than a typical low energy building, and 50-60% lower than the company’s other buildings. The photovoltaic panels and the solar water system on its south elevation provide up to 10% of the building’s electricity demand, with the photovoltaic panels generating approximately 7,000kWh per annum, enough electricity to largely power the building’s ground source heat pumps. The building also provides high levels of occupant satisfaction. According to the Networks Services Centre’s HR department, the staff are extremely pleased with the building. Comments from staff include statements such as: “The roof garden is a great addition, given that we are able to use it all year round,” and remarks that “Great natural light comes into the building through the internal gardens.” And the small number of staff complaints submitted every year also speaks for itself. A diagram shows how the building’s vertical bore hole collectors will be used to provide active heating (above) via a heat pump and passive cooling (top), which can bypass the heat pump when the ground temperatures are at sufficient levels. O’Loughlin explains that, because of the radiant slab heating and cooling strategy used, the building isn’t quite as responsive as a building that uses more traditional heating systems. Yet, as mentioned previously, this slow responsiveness can also be a bonus. “The upside to the slow responsiveness of the Networks Services Centre is that when you switch the heating of, the building doesn’t lose that much heat,” says O’Loughlin. “This means that the building can sometimes remain unheated over a weekend and only lose 2C of heat! Wall system: Stanta Crowley Ltd.
Building type: Detached two-storey 5,200 sqm building to accommodate up to 315 staff, constructed of cast-concrete structural slabs and 9m column grid. The new building incorporates a number of primary functions including: 24/7 national distribution gas control for Ireland, 24/7 emergency response for Dublin and surrounding counties, national training centre, national distribution safety and quality centre, and national distribution operations and construction departments. Location: St. Margaret’s Road, Dubber Cross, Finglas, Dublin 11, Ireland. Electrical 313 kWh/m2/yr consumption (Jan-Dec 2015) including data centres,or 228 kWh/m2/yr minus unregulated energy use. Airtightness: 1.81m3/m2/hr at 50 Pa. Ground floor: 150mm concrete floor slab featuring 50% GGBS on 60mm Kingspan Thermafloor TF70 insulation. U-value of 0.16 helped by low perimeter to wall ratio. Floor finishes variously include Greenguard Gold certified 3mm Artigo Multifloor Uni, BRE Green Guide A+ rated 2.5mm Polyflor Polysafe and Shaw Contract Gradient carpets featuring Ecoworx backing system – low embodied energy, low VOC, 100% recyclable & including recycle content; and Matwells proprietary aluminum profile interior entrance system. Internal walls (Metal stud partition): Gyproc plasterboard either side of a metal stud partition system; stud partition with metal surface cladding system; glazed partition without metal studs; fire-resistant glazed internal partition; retractable folding partition system with sound insulation. Upper floor slab: 1938 sqm reinforced in-situ concrete biaxial slab with with U-Boot recycled plastic formwork to reduce dead load concrete as above. Concrete includes 50% GGBS. Heating & cooling system: A ground source heat pump feeds into the building’s radiant slab system, with heating and cooling pipes set in the exposed concrete ceilings to dampen temperature swings through the working day and reduce overall ventilation requirements. Heat absorbed by the concrete ceilings is released at night reducing the heating requirement at the start of the working day. The radiant slab, similar to a tiled stove, enables lower ambient temperatures compared to conventionally heated office spaces. Heat pump: Eurovent-certified Ciat ground source heat pumps linked to 27 vertical bore holes. 99 kW heating capacity (COP of 4.01). Solar thermal collector: The south elevation of the tower also contains 24 sqm of Carey Sky 12 CPC 5 solar thermal collectors providing hot water for the kitchens, washrooms and showers, with a 1500 litre insulated stainless steel storage tank, and 316 litre DHW accumulation tank. Ventilation: Displacement ventilation system for the office areas with passive ventilation for the canteen, workshops and stores. The displacement ventilation relies on natural air movement between the assisted fresh air supply at floor level and a controlled extraction via a central chimney at the apex of the folding roof. The chimney is contained within a plant tower and uses a natural stack effect for extraction and contains coils for heat recovery. Main air handling unit: Trane CCEB DG 7,5/6 - heat recovery ventilation system, with a heat recovery rate of 59% with run around coil. Electricity: 100 sqm of Carey Glass Solar photovoltaic panels fitted at a fixed angle of 30° to the south elevation of the plant tower providing up to 11,000 kWh of electricity per year. Water: The water management of the landscape strategy seeks to treat as much surface water run off on-site as possible with a series of natural attenuation and filtration areas for the car parking and a large attenuation pond to the south of the building. Green materials: GGBS, low VOC materials, and attention to sourcing materials based on green criteria generally, in terms of the BRE Green Guide to Product Specification, EPDs, etc.